On Thursday, May 8, vocalist Fernando “Fher” Olvera of Maná, the biggest Latin Rock Band in the world, joined supporters of Project Selva Negra in inaugurating a sprawling “Endemic Plant Nursery” near Ahuisculco, a small town located 30 kilometers southwest of Guadalajara, near Tala. 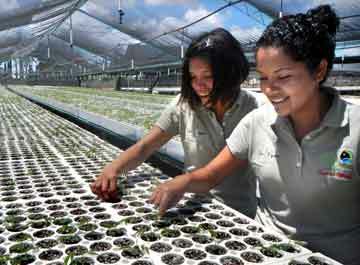 The nursery is already caring for over 100,000 seedlings and will soon be supplying trees for planting to organizations like CONAFOR (National Forest Commission) and Carlos Slim’s Carso, the company which is constructing the Macrolibramiento which promises to divert heavy traffic around, instead of through, greater Guadalajara. I dropped in on Selva Negra project leader Francisco “Paco” Quintero the day after the inauguration to ask a few questions about the nursery, but not really expecting much of a story. To my surprise, I left with an insight into what seems to be an ecologist’s dream come true: a project that benefits nature as well as local communities with funding from organizations seriously interested in reducing their carbon footprints. To help me understand this bigger picture, Quintero took me back to 2010 when Arturo Balderas Torres of ITESO published a paper on reforestation and climate-change mitigation, arising from a project funded by the UK Darwin Initiative. “In his paper Balderas suggested that individuals and organizations should evaluate the damage they are doing to the environment and make up for it in practical ways,” explained Quintero.